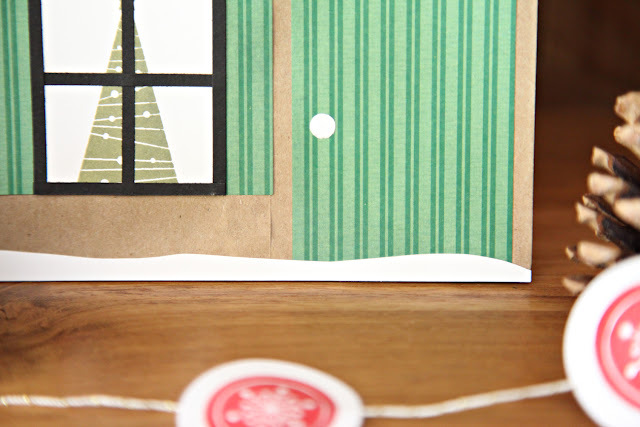 I have a super cute way to package all the mini Christmas gift items—actually, this would also work as party favors, or treat bags if you’re hosting a Holiday party. Plus, it’s simple, affordable, and very easy to assemble. So easy in fact, I didn’t even bother to take pictures of how I did it—or maybe it’s because I was being lazy. Either way, this is a fun project! 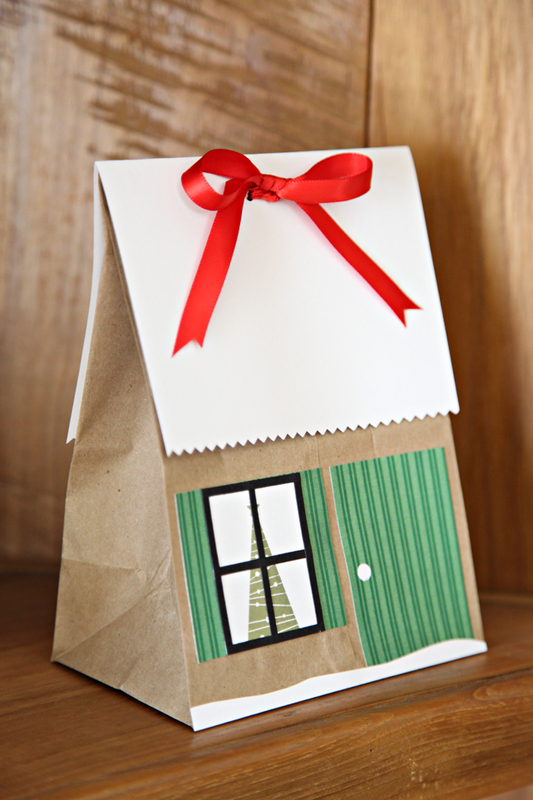 So, all you’ll need for this project is: Brown paper bags from your local dollar store, white cardstock, any pattern paper or wrapping paper for the door and shutters, black cardstock, ribbon, a hole puncher, glue, scissors, and serrated edge scissors (any edge will work). For the roof, I cut a piece of white cardstock at 8” x 5 ½” folded it in half, and cut the ends using my serrated edge scissors, and set aside. I cut piece of pattern paper for the door at 2” x 2 ¾” and used my hole punch on some scrap white cardstock for the door knob. 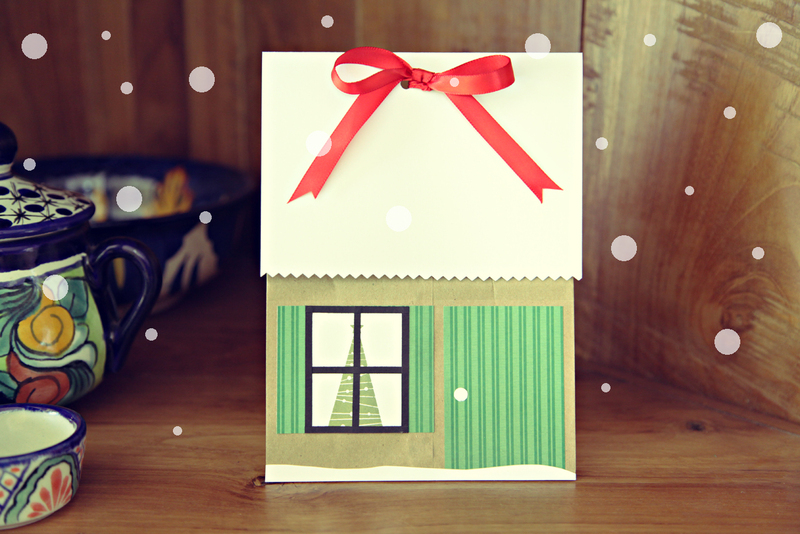 Next I cut the green part of the window at 2 ½” x 2 ¼”, and cut a white piece of cardstock at 2 ¼” x 1 ¾”. Stamped a tree image in green and adhered it to the green window piece (if you don’t have a tree stamp you can simply cut a tree out of another piece of plain or pattern paper). Next, cut out a few slim strips of black cardstock for the window frame and adhere those. 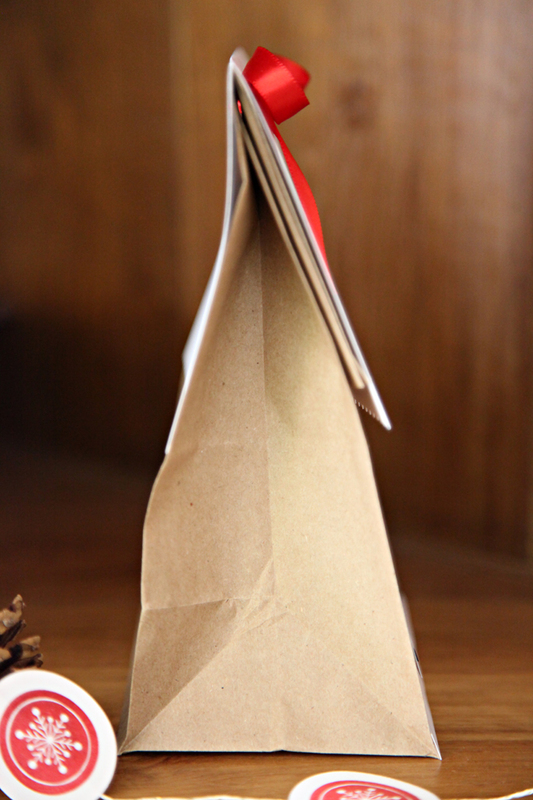 Once those two pieces are finished, you can apply them to the brown paper bag. Next cut out a thin piece of white card stock and hand cut some waves on it for a cute snowy effect, and adhere that onto the bag as well. Once all of those eliminates have been glued you can fill your bag with treats, a gift, or party favors! 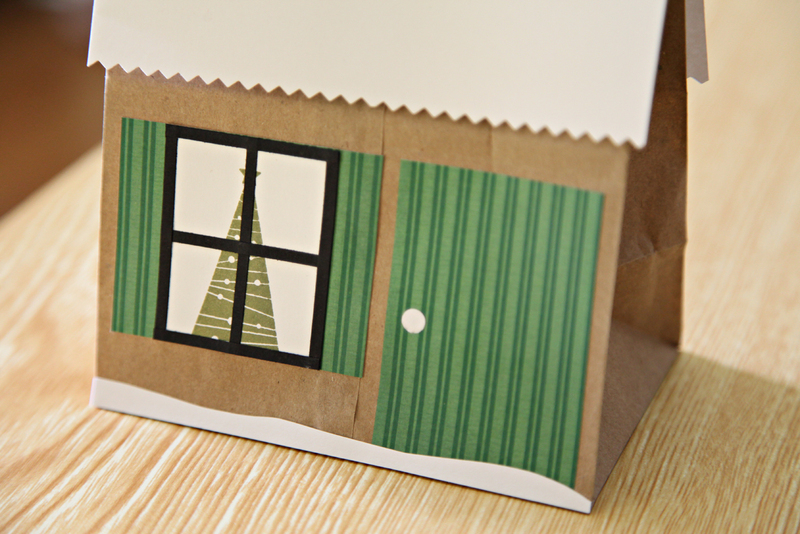 Fold the top over, and place the white cardstock roof over the fold, and using your hole puncher, punch two holes near the top of the bag and apply your ribbon closure. A-dor-a-ble! Thanks for stopping by! really cute! visiting you from the etsy blog team :) great blog! Thank you! I'll be sure to visit your blog! I absolutely love your crafts! I'm a new follower bwt, I hope you will stop by my blog and take a peek around!!! You are seriously the cutest. Post after post I thank God I found your awesome DIY blog haha, I love this! OH what a wonderful idea!! Which Are Your Favorite Cards?